This chic one bedroom apartment is situated in Eixample, overlooking Antoni Gaudí’s Sagrada Familia, arguably the city’s most iconic monument. One whole façade of the apartment looks out onto the Cathedral, improved by a large terrace spanning the width of the property where you can sit out in the sunshine or enjoy an evening meal as the sunsets over this unparalleled backdrop. The sophisticated neighbourhood of Eixample is marked by lots of artisanal cafés, trendy brunch spots, cocktail bars, shops and popular restaurants. Dotted with fantastic architecture and offering excellent transport links, the area is ideal for a stay in the Catalan capital. Sleeping up to 3 people in total, this apartment features contemporary and quirky décor with stylish and comfortable furnishings. The property benefits from plenty of natural light due to the glass doors and windows that lead out on the terrace. The bedroom is spacious, featuring a double bed, large built-in wardrobe and storage space, floor-to-ceiling glass doors leading out onto the terrace and an ensuite bathroom. The living area boasts a large corner sofa, which doubles up as a sofa bed, and a flatscreen television, ideal for evenings in. 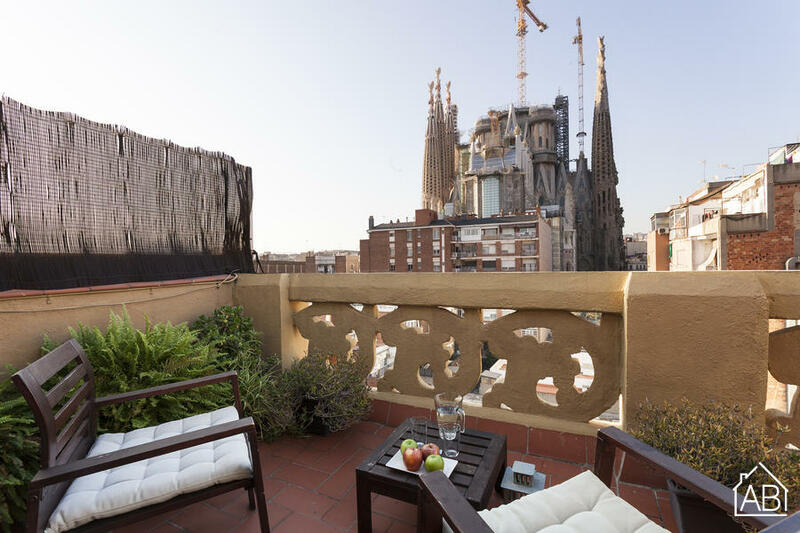 Like the bedroom, the living area also opens out onto the terrace, featuring views of the Sagrada Familia. The kitchen contains all the amenities necessary for a comfortable stay in the city, including a dishwasher, toaster, oven and pots and pans. A separate area containing a dining table and chairs provides an intimate space to enjoy home-cooked meals with friends or family. The apartment also includes an iron, ironing board, a hairdryer, washing machine, and internet. With an unbeatable location offering views of the Gaudí’s most famous work and less than five minutes’ walk from two metro stations, this apartment makes an excellent choice for your stay in Barcelona. Please note: the apartment also offers heating.